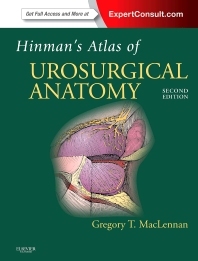 The detailed illustrations in Hinman’s Atlas of UroSurgical Anatomy, supplemented by radiologic and pathologic images, help you clearly visualize the complexities of the genitourinary tract and its surrounding anatomy so you can avoid complications and provide optimal patient outcomes. This medical reference book is an indispensable clinical tool for Residents and experienced urologic surgeons alike. See structures the way they appear during surgery though illustrations, as well as a number of newly added intra-operative photographs. Operate with greater confidence with the assistance of this extensively enhanced complement to Hinman’s Atlas of Urologic Surgery, 3rd Edition.